When I was growing up, ours was on the doorframe between the kitchen and the hall with the red carpet. A vertical trail of penciled dashes and dates that marked the growth of my siblings and I – that eventually got painted over. An archive of ages and heights that proved physical progress was really happening in the Eisaman household. And boy did I want my growth to show. I loved to see the tangible distance between where I used to be and where I was. I loved seeing the evidence of advancement. Progress. Growth. In his letter to Timothy, Paul encouraged him to set an example to other believers in speech, conduct, love, faith and purity (1 Timothy 4:12). He also challenged his young protégé to devote himself to the public reading of Scripture, to exhortation (encouraging others), and to teaching. He told Timothy to be intentional. Move forward in faith. Grow in such a way that it impacts others. I read this and I wonder. What type of spiritual progress can be seen in my life? Am I setting an example in conduct… in the way I behave, react, respond and live? Do I set an example for others in the words I use… in the ways I love… in my purity? Do I reflect Jesus in these things? Am I growing in His image? These questions drive me to my knees. I’m forced to ask God to search me and know me – inside and out. I ask Him to show me the ways that I’ve grown and to show me the ways I still need to grow. The progress I want to see in my life is no longer about a height chart - it’s about a depth chart. I want there to be visible evidence of my faith in Jesus that doesn’t waver in the winds or crumble in the uncomfortable. Don’t you? Though our faith is unseen (Hebrews 6:1) let’s press on in progress and move forward in the hope, joy, love and peace of Christ so that others will be inspired to do the same. Let’s live today in such a way that our behaviors, responses and attitudes showcase a vibrant, honest faith that’s deeply rooted and growing. Dear Lord, Thank You for being so gracious and compassionate with me. Thank You for loving me where I used to be – in spite of me – and for loving me where I am today. Please forgive me for the times I try to move forward without You. Help me to prioritize progress and seek You continually so that others will clearly see You in me. How does the beginning of this letter to the people of Philippi that was written long, long ago stir you toward growing in Christ today? Grab your journal and write a prayer of response. Click here to write a prayer of response on the wall of my blog. 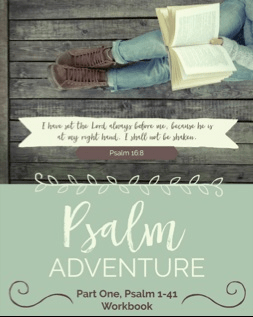 Girlfriends in God cofounder Gwen Smith is hosting a FREE online Bible Study, a PSALM ADVENTURE, beginning September 9th. We’ve gotten countless messages asking how you can know what God says about forgiveness, healing, fear, depression, finances, relationships and hope. You want to know and trust God more, and learn how to connect your personal struggles to His promises. That’s exactly what we’re going to explore in our PSALM ADVENTURE because we’re going right to the source of all grace and truth: the Bible. Join Gwen for this four-week study. LEARN MORE and REGISTER TODAY by visiting GwenSmith.net/PsalmAdventure.